One of my best friends lost her son in an accident and I felt the terrible anguish she and her family faced. I couldn’t imagine how one could go on to grow stronger and more centered in the midst of such tremendous grief. 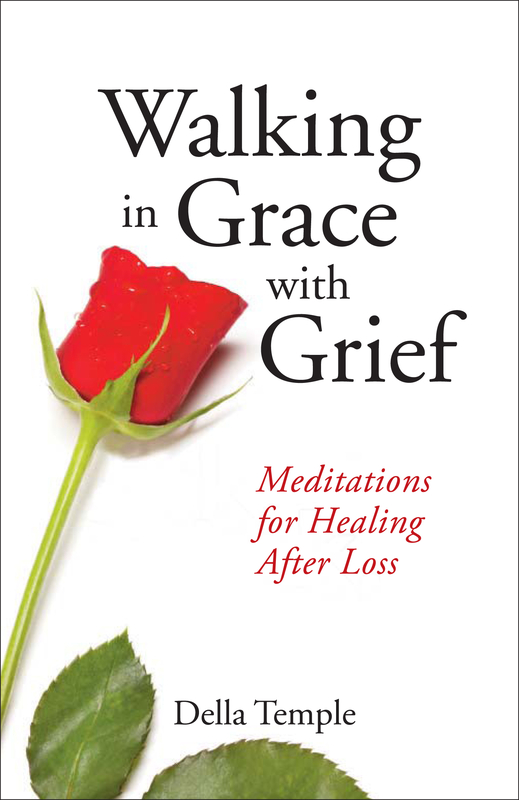 The answers came to me in Walking in Grace with Grief: Meditations for Healing After Loss by Della Temple. She beautifully offers her personal story of the loss of her son and the path she took to release her pain and find comfort in a continuing connection to him. She also describes how others can be of help to those suffering a loss, something we all need to know. Part memoir and part meditation guide, Temple offers powerful guided visualizations to ground yourself, release the pain, grow stronger by filling yourself with universal energy and connecting to your higher self. Della: A few days after the unexpected death of my son, I found myself in what I refer to as a state of Grace. I don’t know how else to explain it. I didn’t feel anger or rage against God. I experienced sorrow, a deep, fathomless sadness, grief, love, acceptance, compassion, and happiness – yes happiness – all at once. I felt the Divine surrounding me, in what I call the energy of Grace, offering me comfort and support. I lived in this protective coating of Grace for most of the first year. It went wherever I went – and it literally felt like I was walking in a bubble of Grace. I wanted to include that in the title of my book, but there was also another part of my experience that was equally important. I don’t believe we walk through grief because grief isn’t something we get over. We walk with grief for the rest of our lives. We will always feel the hole in the heart left by the death of our loved one. The pain lessens, but grief is with us always. Walking in grace with grief is a very literal description of how I felt that first year of loss. Becca: What message would you most like readers to get from your book? Della: Often, we are so caught up in the emotions of sorrow, sadness, grief, anger, rebellion, and outright rage that we fail to hear our loved ones’ voices. But they are here. They constantly surround us with their love and support. We just have to open ourselves up to be able to receive their messages. What I’ve heard from readers is that some of them don’t believe they have the ability to talk Spirit-to-Spirit with their loved ones. Some even believe that they are not worthy or intuitive enough to communicate in this way. What I tell them is to try. One of the easiest ways to do this is to step into meditation. Daily meditation offers us the opportunity to quiet the outside voices and tune into our inner knowingness. Often our loved ones can reach into this space of soft awareness and let us know they are watching over us. Rick’s presence in my life – his Spirit’s presence – confirmed my deep faith in life after life. My mountain of sorrow was lessened because I knew he existed as Spirit, and that was very healing. Becca: We all hear about immersing ourselves in the present moment. What are your tips for doing so, to not focus on what could have been? Della: I’ve come to think that grief is two-fold. It’s the painful longing for the physical presence of our loved one, and it’s the emotional heartache we feel as we disengage from these unfulfilled dreams, the sorrows of what could have been. The stories of a life unlived. Every time my thoughts wandered to the what-if-he-had-lived stories, I pulled myself back. I literally would not allow myself to experience those thoughts. I chose another thought. I would force myself to think of something else – to remember a time from the past when he made me laugh, or to remember his voice or his smell. Anything but a what-if-he’d-lived story. This took energy and effort, but I think it made the difference in how I healed. I shifted the thought and experienced my sorrow in a different vibration if that makes any sense. It was a higher, cleaner vibration – a healing vibration full of love and mercy. This vibration felt full of acceptance, kindness, and gentleness. I knew that if I could stay in this vibration – if I could surround myself with thoughts and feelings that resonated there – I could heal this deep wound. I had energy tools to help me stay in this vibration, and I share those tools with the reader throughout the book, so they too can stay out of the mire of what-could-have-been. Defusing the power of the story allows you to return to the present, the now, the current situation without the baggage of what could have been, should have been, or wasn’t meant to be. Releasing my old stories allowed me to look at Rick’s death from a new perspective. It wasn’t about what could have been. It’s about what is – right here, right now. I still felt the pain, but it was a pain of missing my loved one right here, right now. It was not about all the future things that would not be. Becca: What helped you most during your time of grieving? Della: What helped me most during this time of sorrow was to embrace fully the concept of life after death. I have always believed in reincarnation – that we exist as eternal Spirits and come to earth to experience certain challenges and emotions. As we make ready for our trip to earth, we call together the Spirit forms of our soon-to-be-parents, siblings, friends, and colleagues. God is there too. We gather around a big “conference table in the sky,” and we design our soon-to-be life. We think about what our main purpose will be in this lifetime, and we design a life that presents many challenges and learning opportunities. Some of us choose to deal with only one issue; others choose many. Everyone at the table agrees to be a participant in this Contract of Life. Some will choose to be our mentors and trusted friends. Others will choose the harder role of being the “mirrors,” the ones who push our buttons and cause strife and disharmony. Each will take on a role that enhances the learning opportunity of both parties. This Contract of Life includes many variables, or different paths that a person may take once they come to earth. Some paths are straight and narrow, leading right to the person’s overarching purpose while other paths are full of curves and unexpected dips and bumps. Some life paths are long, and others are short. Every day that a person is alive, she or he chooses which path to travel. This is free will in action. Becca: What advice do you have for first-time authors who feel they have inspiration to share? Della: Write! Journal, doodle, scribble – it doesn’t make any difference. Just move your story out into the world. Some people I know are more comfortable doing short videos, others write poetry. Don’t worry about whether it’s “good enough” – just share. You will get feedback along the way about your writing style, and that will help you craft your message so that it resonates with your audience. Most of us (especially me!) worry about what others think of our writing. Some of the energy tools I teach in this book helped to tame my inner critic, giving me the confidence and willingness to share. Walking in Grace with Grief is available at Amazon.com. To contact the author, go to www.DellaTemple.com.